SUNSHINE Coast dad Josh Neuendorf is a 28-year-old father of three beautiful girls, and he nearly died after contracting the flu, and then something much more serious. The construction worker came down with Influenza A a month ago, and was taking antibiotics to help. When his temperature skyrocketed on Saturday, July 29, he was rushed to hospital, and was discharged the following day. Family friend Sheryl Nagel said he was told to go home and ride it out, but within a day things were much worse. "Early Monday morning he had a rash covering his whole stomach, chest and back, intense chest pain, and (was) finding it hard to breathe," she said. "He was rushed to the doctor, who put him straight onto a drip and called an ambulance and sent him back to hospital. "They did some tests and kept him overnight where he then crashed and was rushed to ICU." Josh was placed into an induced coma, and that was when an abscess was found in his neck. His lungs were three-quarters filled with fluid, his windpipe was torn and it was discovered he had a bacterial streptococcal infection, Ms Nagel said. 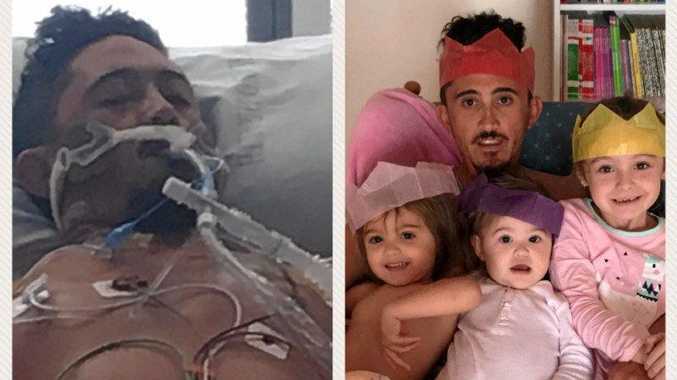 He had an operation to remove the abscess and clear some of the infection before being airlifted to hospital in Brisbane where another operation was performed to drain the fluid from his lungs and flush out more bacteria. "Unfortunately he suffered toxic shock syndrome, where all of his organs shut down," Ms Nagel said. "Josh also suffered a punctured lung during his surgery, his heart was extremely weakened and not functioning properly, and he also had a substantial amount of fluid around his brain." Now Josh, described as a devoted loving dad, beautiful partner, great friend and hard worker, is facing a long and difficult recovery, learning to walk, read, write, eat and talk again. "Josh, however, has lasting effects on his heart and will be on heart medication for an unknown amount of time," Ms Nagel said. In an effort to help Josh and his young family deal with the life-changing illness that struck out of the nowhere, Ms Nagel started a crowdfunding page. "We are just asking for some help to cover rent, bills and medications on Josh's road to recovery, as Josh was the sole provider for his family and in casual employment," she said. "There is now no income coming in for his young family. "This would help Josh and his family just focus on getting him better, without all the stress and worry about not being able to provide for his family." The community has rallied around Josh and his family, raising $4681 in just three days.